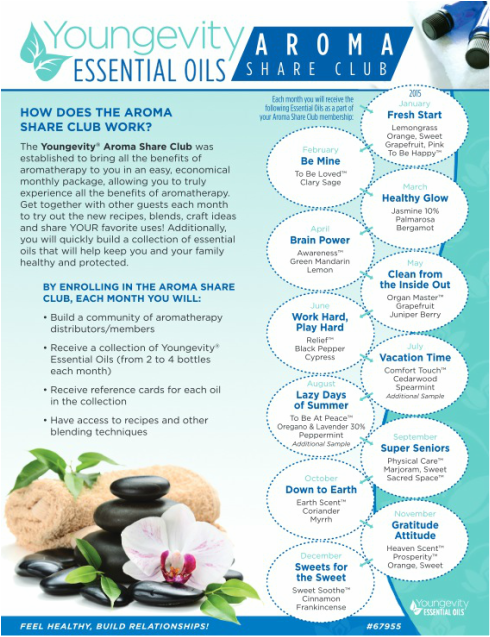 Check out the back of this catalog to see the Essential Oils section! Top 10 oils and favorite Blends are also highlighted! Therapeutic medicinal grade oil(s) must be able to be traced back to the field and distiller from which it was produced and the exact chemical makeup must be known. This is why we (Ancient Legacy) choose to carry E.O.B.B.D. oils (H.O.B.B.D. in French) oils. The E.O.B.B.D. label is your guarantee of purity. This label is only granted through the I.N.S.A. (Institut de Normalization Scientifique d’ Aromatologie), a scientific committee of independent health professionals based in Europe. E.O.B.B.D. means Essential Oils Botanically and Biochemically Defined. Our source laboratory in France was awarded the H.O.B.B.D. certification, as a result of origin and quality controls operated on each lot of essential oils sold. A real quality assurance system is set up; tracking of lots, botanical descriptions, organoleptic characteristics, extraction mode, full physical and chemical analysis, (GC/MS coupling). These controls are made under the responsibility of a Ph.D. pharmacist. The experience of our "true aromatherapy" will be a memorable one. Ancient Legacy™ creates its exceptional products following a very simple principle: It must provide a quality experience. The quality is apparent from the moment you open the deep violet bottle. Every product is a result of a painstaking search for the highest quality essential oils, continuing research and education and years of personal experience. Our 'true aromatherapy' products contain a wide variety of exotic and natural essential oils distilled from flowers, herbs, trees, and spices, such as Tea Tree from Australia, organic Rose damascena from Turkey, East Indian Sandalwood, French highland Lavender vera and Cinnamon from Madagascar. The AROMA SHARE Club ... a fun & affordable way to build your collection! Join the Aroma Share Club! 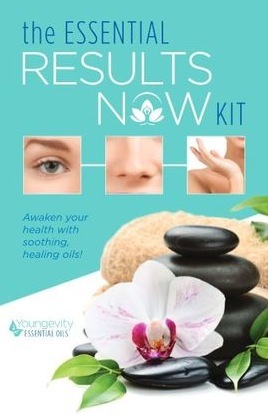 The Results Now (RN) Kit: Featuring 7 of Youngevity's Essential Oils, is an advanced way to tune into your body's communication. The RN assessment uses specific essential oils as stimuli, assessing a body's response to each essential oil in each of the seven targeted body systems. The goal being to determine which essential oil will be the most beneficial to that individual's particular condition. How the body responds to each essential oil will indicate which system requires further attention. 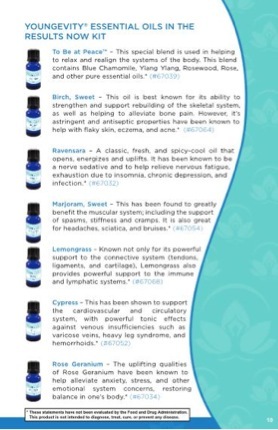 Follow link to view all the oils available, as well as their descriptions. Botanical Spa Skin Care - infused with Essential Oils! 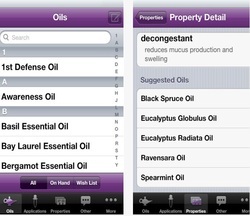 The Essential Oils app is an educational tool and reference guide designed by an essential oils user for essential oils enthusiasts to be able to easily access information regarding oil properties, suggested uses, custom recipes and personal inventory and get the most benefit and use from their investment in essential oils. This App is designed specifically for Youngevity Essential Oils.